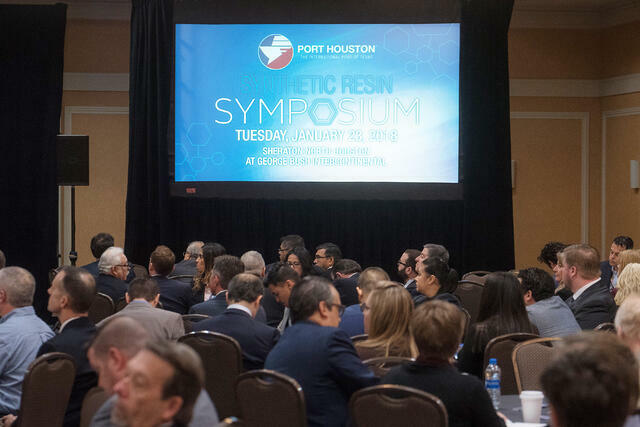 Nearly 280 beneficial cargo owners, shippers, ocean carriers, and logistics providers attended Port Houston’s third annual Synthetic Resin Symposium Conference Jan 23. Resins are a solid plastic substance used to make many of our daily consumer products such as bags, cups, car parts and toys. The event focused on the local supply chain, current market trends, as well as rail, highway and port infrastructure. Port Houston continues to invest in its facilities to serve customers and partners export needs. Houston is home to the largest petrochemical complex in the U.S. Port Houston is unique in the fact that it is one of the few operating ports in the nation. A panel of ocean carriers with Maersk Line, CMA-CGM and COSCO Shipping discussed readiness and container capacity for resin exports. “Port Houston is a great key partner. We are excited about the Houston market,” said one carrier executive. “We look at Houston as an investment for the future,” another panelist noted. IHS Markit forecasts that the Port of Houston will be the dominant U.S. export player in coming years. With new packaging and production facilities coming on line throughout the Gulf region, capacity expansion for resins will allow Houston to be an important gateway for this cargo.